On August 26, 2015, MS made it known that the Windows 10 installed count had surpassed 75 million. A quick look at the calendar shows me that 8/26 is exactly four weeks after 7/29 (the day Windows 10 hit RTM status, and Build 10240 became available to non-Insiders). A fascinating article on Supersite for Windows entitled “Windows 10 Momentum” digs into these numbers, and also exposed me to a new and very different, UK-based source for online user population data named GoSquared.com. 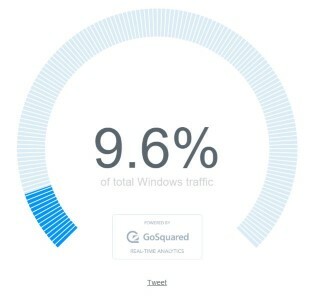 GoSquared reports a very different fraction of Windows traffic from Win10 as compared to NetMarketShare. Last week, I blogged about an earlier 67-million-installed figure from unofficial sources that apparently equated to a fraction under 1 percent of all desktops it monitored through its tens of thousands of sites. GoSquared, on the other hand, reports some very different statistics — namely, instantaneous readings that vary from a high of just over 20% on August 23 to a low of under 1% right out of the starting gate on July 28 (as far back as its data goes). I believe these numbers reflect the breakdown by Windows version (and the line graphs underneath the circular indicator shown above show the breakdown across Windows 7, 8, and 10 for the entire time line covered) at any given point in time graphed. What’s not clear to me is the size of the population that’s being monitored and how that population is composed. GoSquared is a subscription service which makes the population self-selecting (those willing to sign up and pay for its services). What’s fascinating is the idea that if Windows 10 is indeed roughly 10% of the Windows population active on the Internet at the time the graph was generated, the total number of Windows users online falls under 1 billion. This makes more sense than the 17 billion figure I calculated last week, predicated on the assumption that all Windows users were online and that the number of online Win10 users scales smoothly into the overall number of Windows users across all versions. Alas, that’s not really the way that it works, because at any given moment we’re measuring only a fraction of the global population, excluding the approximately 1/3 of the globe that’s in its prime sleeping hours at that time. Assuming instead that we can measure a maximum of 2/3s of Windows users at any given moment, that raises the global Windows population to something in the neighborhood of 1.12 billion. But given the wide range of fluctuation in the Windows 10 numbers available by tracking the graph on GoSquared across the past week (which runs in a range from over 8 percent to under 15 percent of active users at the time of monitoring) we get a sense that the population is pretty fluid and changeable in size. What I do like about these numbers is that they show a more realistic notion of what the overall population of Windows users might be, and put Windows 10 in a more realistic position vis-à-vis the other common versions in use (though XP and Vista are not on this radar). It remains very interesting to watch Windows 10’s explosive growth, and to see how that curve continues to climb. To me, that makes upcoming quarterly and yearly milestones equally interesting, especially as indicative of overall trends. Free is a pretty big incentive. All the hype is a big motivator. However, after upgrading two of the six machines used by those in this house, I don't feel any incentive to upgrade others. W10 is a bit faster startup and shutdown, which I appreciate, but otherwise I am not thrilled. The changes in the total environment are a severe hamper to those of us who do serious work on our computers for many hours a day. I suspect there will be many who will be perfectly happy to stay with their Windows 7 just to avoid the hassle of changes. Microsoft has made it much easier to change but the results are not compelling. I am not impressed by fancy graphics.